There is something almost magical about sitting around the table with our loved ones sharing a meal during the holiday season. These meals bring us together to celebrate and enjoy our time together. They offer us a chance to connect and remind us how truly grateful we are for the people in our lives. It comes as no surprise that these meals we serve up during our holiday celebrations are a little more elaborate than those we serve through out the year. It also comes as no surprise that holiday cooking can be a little stressful for many people. Taking some time to do a little holiday meal planning can greatly help reduce that stress. Last year I started planning our Christmas dinner in early November. I can so clearly remember the night I realized that my physical limitations were going to present some unique challenges for cooking Christmas dinner. It was the first night I had to cook after the accident. My husband had been called in to work earlier in the day and wasn’t going to be home in time to bring home take out let alone cook dinner. There were no leftovers to warm up and nothing easy like frozen pizza to toss in the oven. It took maybe 40 minutes to make dinner, but it felt like I had just spent the day in the kitchen. It felt kind of like I just finished cooking Christmas dinner. That was the night I realized that if I wanted us to have our traditional Christmas dinner, I was going to need to start my holiday meal planning and prepping as far in advance as I could. Last year I made lists on note paper to help me plan and plot my holiday meal prep. 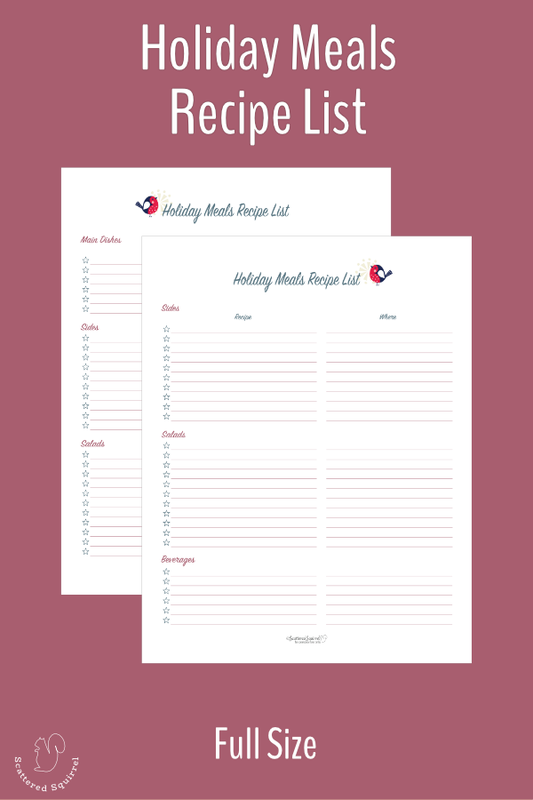 I found those lists to be so helpful when it came to planning our holiday meals that I turned them into printables. Just like baking section, the lists and planner pages below not only helped me with my holiday meal planning, they had the wonderful side effect of helping reduce the stress I usually experience when it comes to cooking during the holidays. Just like with the baking, making a master list of our recipes we use during the holidays is the first step. One of the members in our Facebook group shared that she keeps all her holiday baking recipes in a folder that she stores with her cook books, which makes it really easy for her to grab them out when she needs them. You could do this with your other holiday recipes too. I chose to make a master list because the recipes I use are spread out between various cook books. 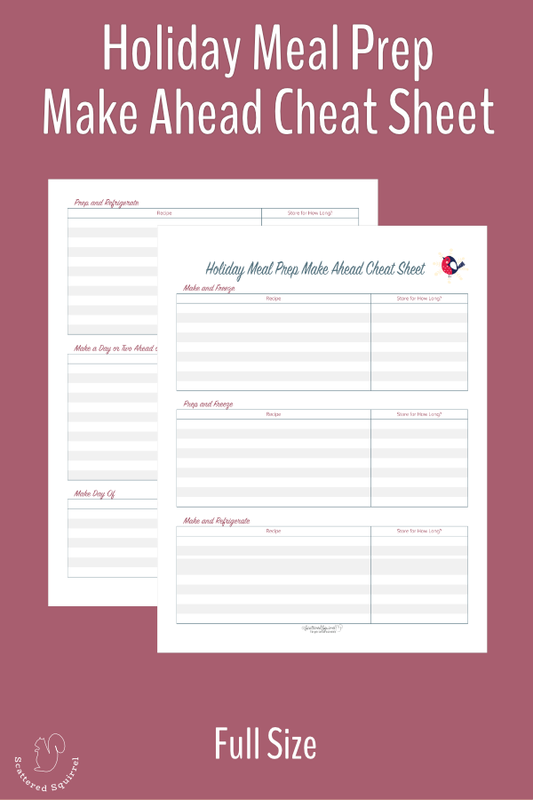 If you’d like to create a master list too, check out the printables below. The next thing I did was sit down to figure out what I could make ahead of time. Spreading the cooking out over a week or even two can really help make the day of the big meal run so much smoother, especially if you’re like me and don’t particularly like to cook. 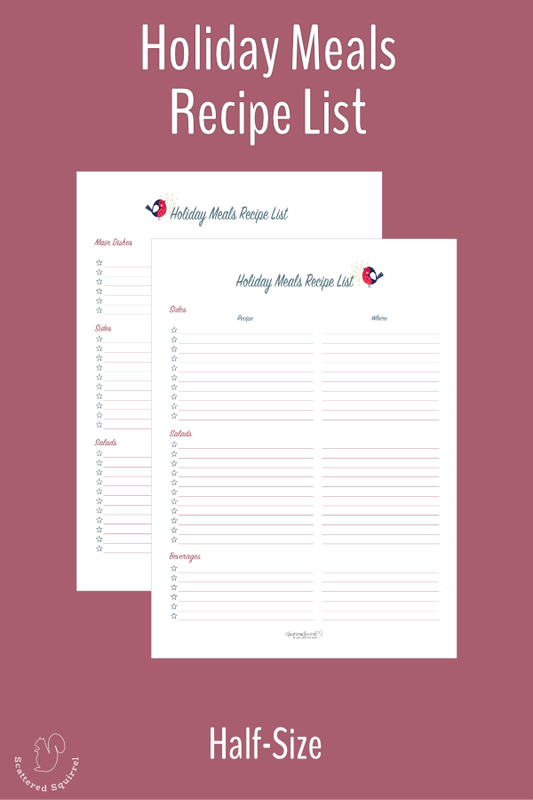 The printables below are similar to the ones I shared for the baking section, and they really came in handy for cooking our holiday meals too. Knowing what can be made ahead of time allows you to weave some holiday meal prep into your normal cooking throughout the weeks leading up to the holidays. This greatly helps reduce the stress of trying to do it all on the day of your holiday meal. The final step in my holiday meal planning is, well, planning our holiday meals. Though we tend to make the same things each year, it’s nice to have a plan all laid out on paper. 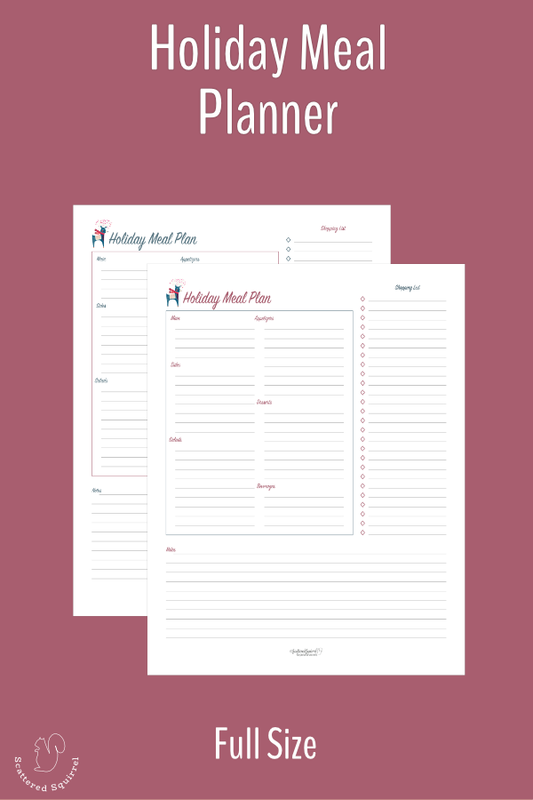 The holiday meal planners below allow you to plan your meal according to course/kind of dish, have a shopping list section, and a small notes section at the bottom. I find the note section helpful for making notes for future holidays. Today’s assignment is pretty simple. Take some time to do your holiday meal planning. Even if you can’t plan it all today, get some of those ideas down on to paper. Figure out what you can make ahead and make a plan for that. 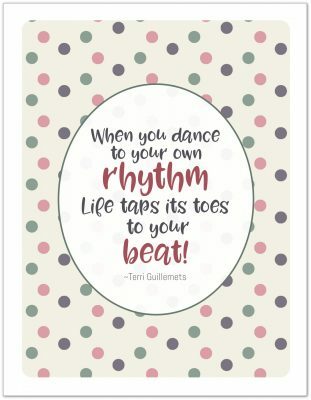 Use the printables above if they work for you, or use another form of planning that best fits your needs. Make it fun. Grab your favourite holiday drink and listen to your favourite holiday music while you work on it. Taking the time to plan your holiday meals now, will help save time and stress later. One of the best things about creating a holiday planner is that a lot of the holiday planning we’re doing this year is ground work for years to come. 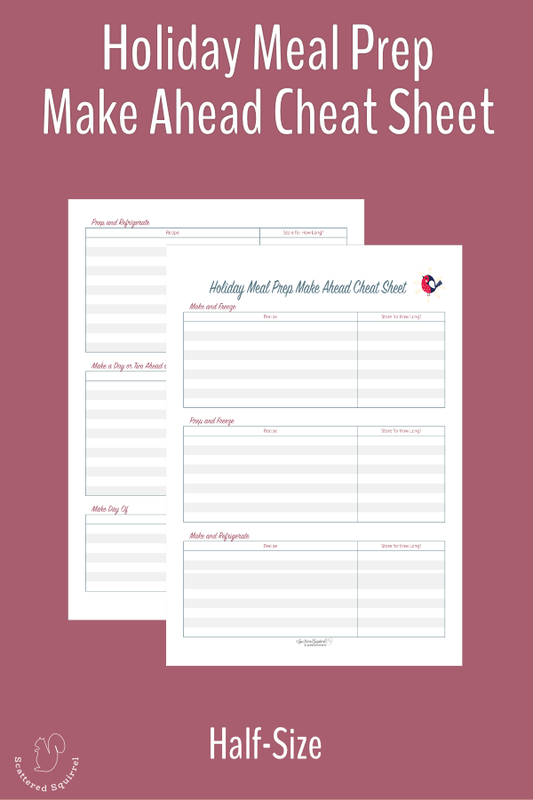 All of the printables in today’s posts are ones you can fill out this year and use over and over again in the future. 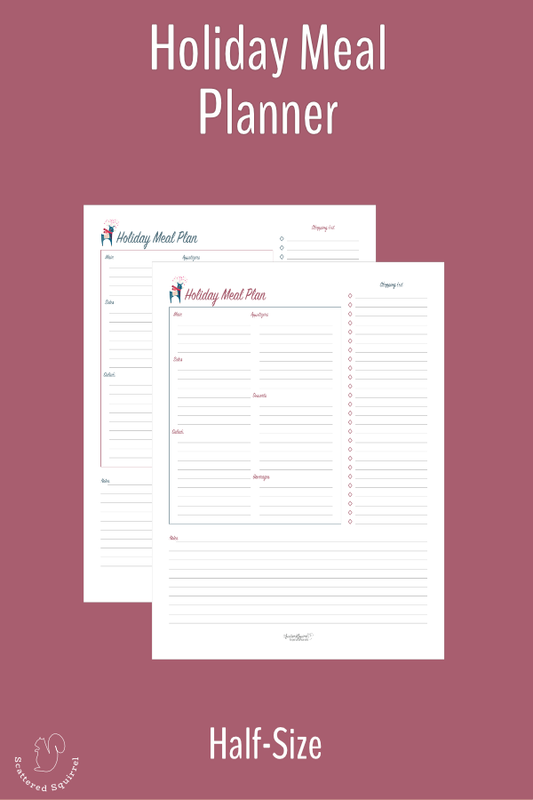 Even the holiday meal planners can be kept from one year to the next. You might not make the same dishes each year, but the notes you make might help make planning future holiday meals easier. When we make things easier we help cut out a chunk of the stress that we might feel, and that is a wonderful thing. What is your favourite dish to make during the holidays? Hop on over to the Facebook group and share your answer there, or if social media is not your cup of tea, feel free to drop a line in the comments below. Until next time, I hope you have some fun with your holiday meal planning.